This page includes memories of and miscellaneous information about WARWICKSHIRE units. (Places are listed alphabetically and are based on the 1940s county boundaries). OVERVIEW (1940) - INITIAL BATTALIONS (1940) - BIRMINGHAM ATTACKED! (1943) - STREET FIGHTING SCHOOL - POST OFFICE HOME GUARD - A.F.S. HOME GUARD - CITY TRANSPORT DEPT. HOME GUARD - CITY UTILITIES HOME GUARD - NOTABLE VISITORS - FACTORY UNITS - MILITARY/CIVILIAN EXERCISES - OTHER BIRMINGHAM WW2 INFO. 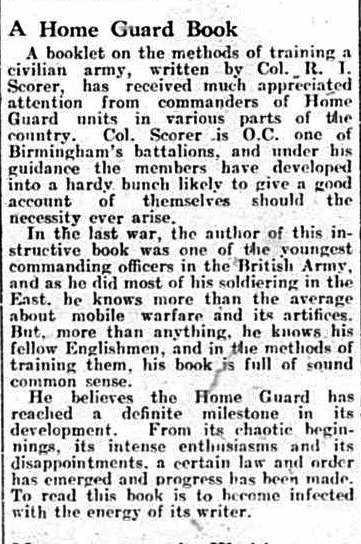 An overview of the Home Guard in Birmingham in September 1940 is available within this website. It includes messages from the Lord Mayor (himself a Battalion commander) and from the HG Zone Commander; images of early parades; portraits of Battalion C.O.s; mention of Dunlop's pigeon post; and details of Ladywood's own naval force. The initial ten Battalions in September 1940 are listed elsewhere in this website. Their Commanding Officers are identified and images shown. A massive exercise took place over the weekend of 6/7th March 1943 when HG units from Staffordshire and Worcestershire attacked the city from the south and west. The defence of the city was the responsibility of the Birmingham's own battalions. Around 10,000 men were involved. "Fighting" took place in many areas, the main thrust of the attack concentrating on Harborne and Selly Oak with subsidiary engagements involving street-by-street penetration of the suburbs - all at the same time as a theoretical aerial bombardment of the city. A contemporary description is available. Birmingham had its own Street Fighting School. There are various pages relating to this School providing information about location, individuals, course details (including the script of a play performed by instructors) and the training area off Bristol Street in the area of Ashley, Wrentham, Essex, Gooch and Kent Streets. Links to these pages are provided within the box to the right. The Post Office Home Guard unit was formed at an early stage. It consisted of Post Office employees and later evolved into the 47th Warwickshire (Post Office) Battalion. At least four members of this Battalion lost their lives in the course of their service : Vol. George Tibbitts, aged 42, of 95 Perry Common Road, Erdington, Vol. Dennis Herbert Phillips (see further information under Sparkhill below), Squad Leader William Edward Howkins, aged 23, of Sutton Coldfield and F.W.T. Charles of 191 Queen's Road, Yardley. Vol. Phillips and Squad Leader Howkins both died in the same incident when a direct hit occurred on the unit's guard room at the Post Office depot during the night of 22nd/23rd November 1940 when the city was subjected to severe bombardment. A separate page of this website describes the tragic circumstances and also those leading to the death of Vol. Tibbitts and of Mr. Charles. Mr. John Ashmore has provided us with details of less serious incidents involving this Battalion (although at the time they were no doubt taken very seriously). The unit based at Newhall Street (Telephone House) was the subject of a letter of complaint by Mr. William A. Bull who worked in the Repeater Station and was also signed by every other member of that department. (The list of signatures read like a Who's Who? of Post Office senior management in the 1970s). It concerned the third occasion on which a weapon had been discharged from the yard and this time the shell had ricocheted around the apparatus room, smashing a lamp. Could the Home Guard be found somewhere else to do their Rifle Drill, please? Information and images relating to the 35th Warwickshire (Birmingham) Battalion which consisted of members of the Birmingham Auxiliary Fire Service (A.F.S.) ; and of A.F.S. Depot 6/1 which was located in Washwood Heath. Birmingham City Transport Department was one of the first to form a Home Guard unit in the city, to defend its premises and equipment. (Please see The initial ten Birmingham battalions). The unit eventually expanded to become the 31st and 32nd Warwickshire (Birmingham) Battalions. These Battalions consisted entirely of members of the City Transport Department. They were based at the various departmental premises throughout the city and their primary role was to defend and protect these depots against enemy action of any kind. A section of this website reproduces a detailed commemorative booklet which was published in January 1945 and, amongst much else of interest, lists every member of the two Battalions. A further page in this website also gives information on those Battalions and one or two of the men who served in them. Pte. Hubert Watkin was a member of the 31st Battalion. He was based at Arthur Street, Small Heath. Information about him is here. BIRMINGHAM CITY UTILITIES HOME GUARD - 29th Warks (B'ham) Battn. "A" - The Civic Guard, Council House. "B" - The Gas Dept. "C" - The Water Dept. "D" - The Salvage Dept. As was the case with the 31st/32nd Battalions which comprised members of the city's Transport Department, the Corporation issued a commemorative booklet after standdown. This contained much information about the 29th Battalion's activities and membership. The entire contents of "The Birmingham Corporation Home Guard - 29th Warwickshire (Birmingham) Battalion" appear within this website. Birmingham had many Notable Visitors during the war. All of these visits would have been provided with a Guard of Honour, manned by members of the city's Home Guard battalions. The linked page shows a few of these visits. Several Birmingham battalions had specific responsibility for the various factory units in their area. The 25th Warwickshire (Birmingham) Battalion was one of these - please see ASTON and NECHELLS below for further information. An image of its C.O., Lt.-Col. S.W.G. Walker and a number of its officers can be seen here. - The weekend of 6th/7th March 1943 - an attack from the south and west. The Birmingham History Webring forums contain a wealth of information and reminiscence about Birmingham during WW2. Use the index or the search facility on the site to find particular aspects. Another excellent resource is Matt Felkin's "Wartime Birmingham and the Blitz" Facebook page. 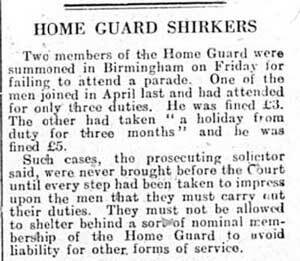 - A short history of Home Guard activities in Birmingham may be seen here. (You will leave this site). Denham, Alfred Albert, Sergeant, 6th Warwickshire (BSA Birmingham) Bn. Home Guard. Husband of Katie Winifred Denham, of Springfields, Wolverhampton. Died - 12 January, 1941. Aged - 31. - In the King's Birthday Honours of 1941 is included the name of Capt. F.R.B. Whitehouse who was awarded the M.B.E. for his services to the Home Guard. Capt. Whitehouse was Field Engineer Officer for the Birmingham Zone of the Home Guard. - Vol. 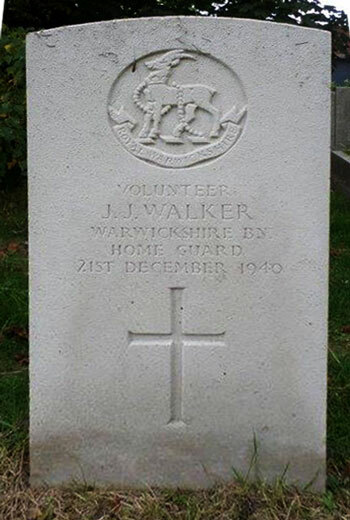 John James Walker of an unknown Birmingham Battalion died on December 21st, 1940. His grave is in Witton Cemetery. 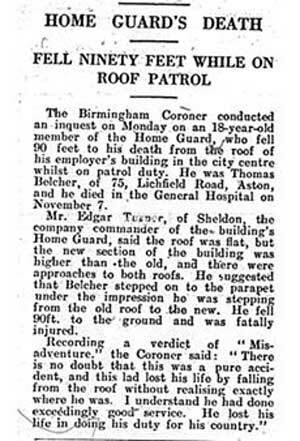 Information about the circumstances of this unfortunate Home Guard's death can be read here. (see right - grateful acknowledgement to Maggie Laity and Matt Felkin. Nov 2015). 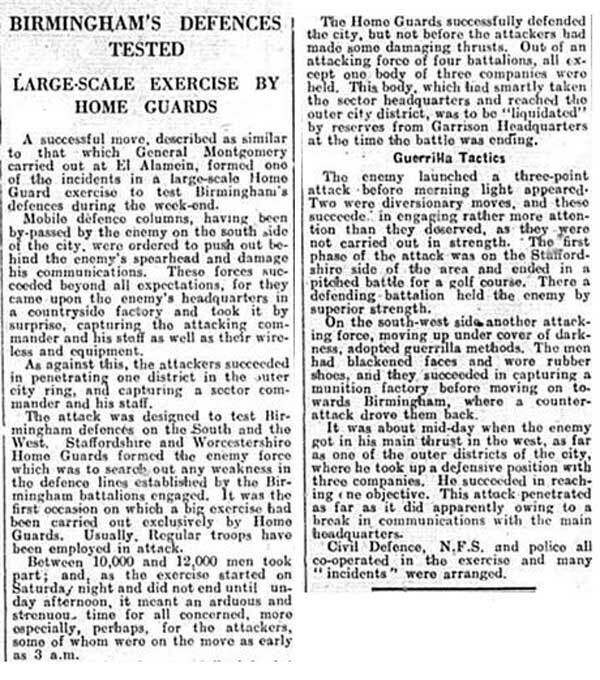 The following press cutting describes a major exercise which took place on Saturday and Sunday, 6/7th March 1943. Possibly the Home Guard, possibly Army troops, involved in bomb damage clearance in an unknown Birmingham street, 1940 or 1941. 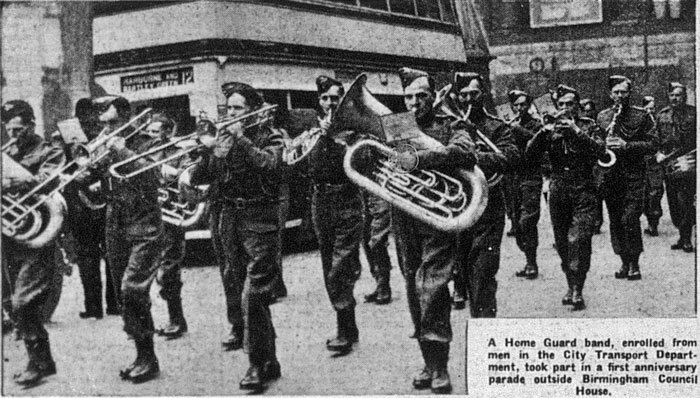 An unidentified Birmingham Home Guard unit, perhaps one Company within a Battalion. From June 1942......The author of this book, Lt.-Col. R.I. Scorer, commanded one of the initial ten Birmingham battalions - the 10th Birmingham Battalion which evolved in early 1941 into the 30th Warwickshire (Birmingham) Battalion which he continued to command. Use Search to find other references to this officer within the website. Grateful acknowledgement to Matt Felkin and his "Wartime Birmingham and the Blitz" Facebook page for the cuttings and images immediately above. A non-H.G., non-WW2 page dealing with another aspect of Birmingham history is contained within this website: images of the King Edward's School building in New Street, 1838-1936). A further non-H.G. page with a tenuous link with Birmingham but dealing more with aspects of European history between 1932 and 1945 is Two Birmingham Businessmen in Berlin. Please see BIRMINGHAM, ROBIN HOOD below. The Ministry of Labour and National Service in Staniforth Street enquires of Messrs. Fellows & Darby Ltd. of Snow Hill whether they wish to make any representation concerning the imminent conscription of their employee, Mr. A. Terry of Ashted, into the Home Guard. 25th Warwickshire (Birmingham) Battalion - Lt. Col. F. Jackson. The story of Aston Home Guard's two heroes, Section Leader Alfred Henry George Brunges and Patrol Leader Charles William Lovelace Tozer of the 22nd Warwickshire (Birmingham) Battalion who won the George Medal for their bravery on the night of October 26th 1940. Pte. Joseph Bennett joined the 22nd Warwickshire (Birmingham) Battalion - which had responsibility for areas of Hockley and Aston - in December 1940 at the age of fourteen-and-a-half and served until stand-down. Click here to read his story. Mr. Arthur Musson remembers his Home Guard service with the Hercules factory unit, part of "D" Coy. of the 25th Warwickshire (Birmingham) Battalion. An image of the Battalion C.O., Lt.-Col. S.W.G. Walker, and a number of its officers can be seen here. A contemporary account of an air raid on Aston, on an unknown date and involving Albert, Frederick and Victoria Roads, with which various named members of the 23rd Warwickshire (Birmingham) Battalion were closely concerned. The headstone (right) of Volunteer J.W. 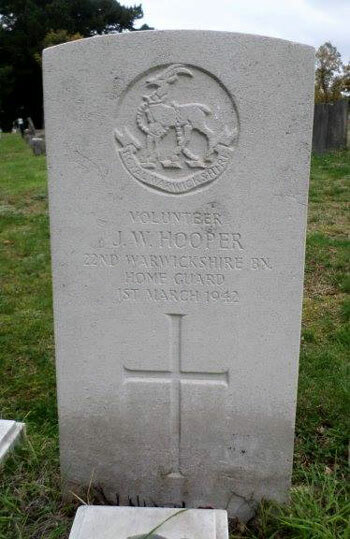 Hooper of the 22nd Warwickshire Battn. in Witton Cemetery. He died on 1st March 1942 at a hospital in Shifnal, Shropshire. Grateful acknowledgement to Maggie Laity and Matt Felkin and his "Wartime Birmingham and the Blitz" Facebook page. There is a fascinating film clip here showing "D" Coy. of the 23rd Warwickshire (Birmingham) Battalion parading in Trinity Road and Aston Park. Many individuals are clearly visible and recognisable. (You will leave this site). The Astonbrook-through-Astonmanor website contains a number of interesting memories of wartime Aston. (You will leave this site). Here is information on Sgt. Jim Baker of Fordrough Lane and the Bordesley Green Home Guard unit of which he was a member, "B" Coy. of the 39th Warwickshire (Birmingham) Battalion. And reminiscences and images from another member of the same unit, Pte. Geoffrey Bennett including the night when he and his section overran Elmdon Airport! Information on the Nuffield Spitfire factory, its Home Guard unit and Edward Johnson who was active in both, can be seen here. Another employee and member of the factory HG unit - as well as a trainer of Air Cadets - was Cpl. George Ronald (Ron) Barton whose story is told on a further page of this website. 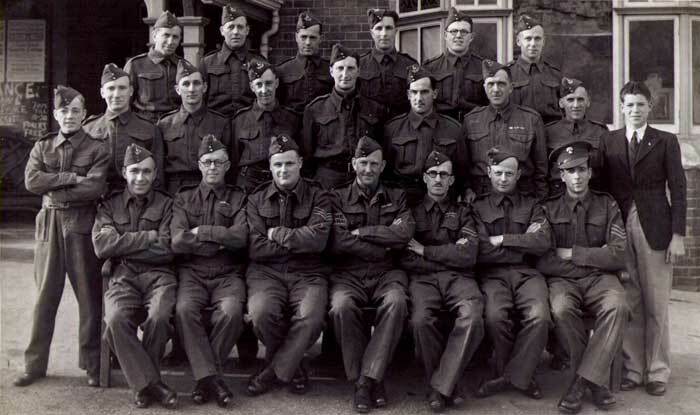 Click on the thumbnail to see an image of the factory Home Guard unit of J. B. Brooks & Co. Ltd. (J.B. Brooks's factories, which were subject to incendiary attack, were located in the area of Great Charles St., Livery St., Ludgate Hill and Lionel St. Their products included bicycle and motorcycle saddles and the Antler range of travel goods. Their wartime products included parachutes and harnesses). The 45th Warwickshire (Birmingham) Battalion may have been responsible for the centre of Birmingham. 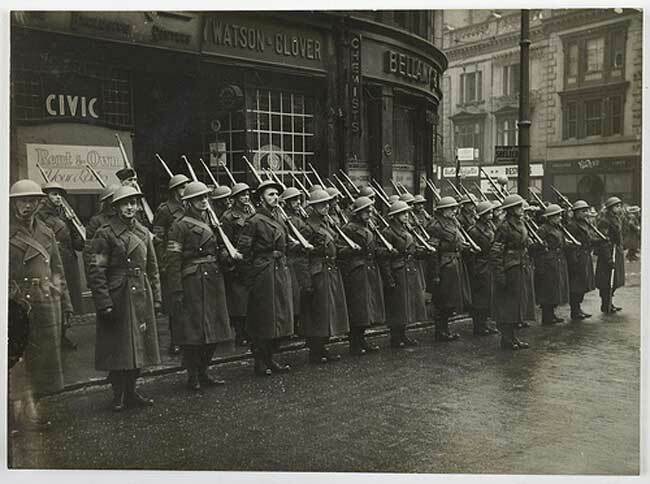 Here is a press photograph image of the Battalion parading in the city on Sunday 13th December 1942 which appeared in the Evening Despatch a day or two later. 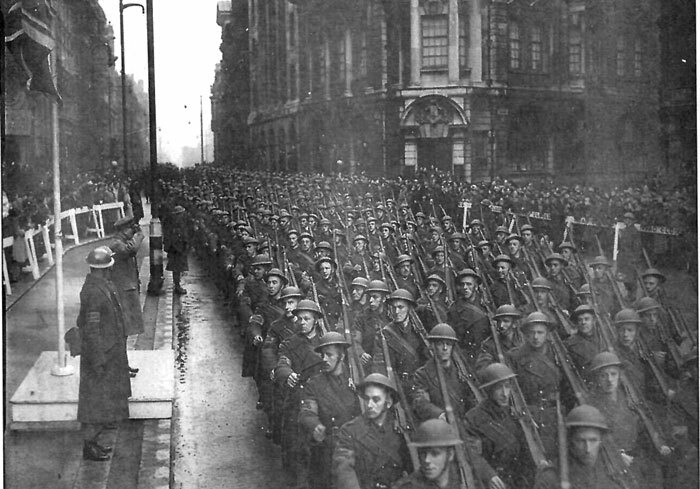 The following image shows another parade in the city centre: this one occurred on Sunday, 23rd March 1941. It shows a Drumhead Service, held on the Municipal Car Park, arranged by the Chaplain, the Archdeacon of Aston. This was followed by a march-past outside the Council House with the G.O.C. Western Command, General Sir Robert Gordon-Finlayson, taking the salute. Grateful acknowledgement to Sue Birtles; Birmingham History Forum; and Matt Felkin and his "Wartime Birmingham and the Blitz" Facebook page. The headstone of Corporal T. Kelly of the 45th Warwickshire Battn. who died on 17th November 1943. The circumstances surrounding Cpl. Kelly's death are unknown but the fact of his having a C.W.G.C. headstone suggests that his death was associated with his Home Guard service. 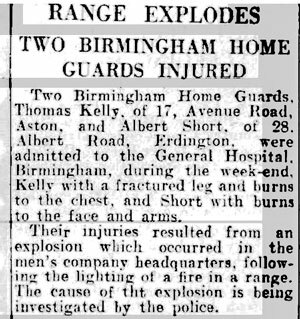 It is possible that the newspaper cutting (below) from January 1943 is relevant but at present there is no means of knowing whether these two T. Kellys are one and the same man; nor whether the reported accident had such dire consequences 10 months later. 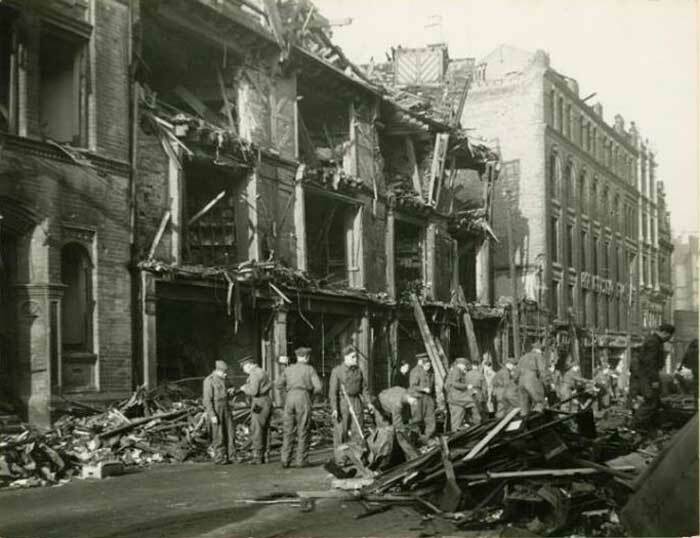 The linked page stands in memory of the victims of the Bishop Street bombing of the night of 15th/16th October 1940 and in particular the heroism of Section Leader George Walter Inwood of the 10th Warwickshire (Birmingham) Battalion Home Guard for which he received a posthumous George Cross. There were many other acts of great bravery on that dreadful night from a number of people including Messrs Tidball (HG), Wade (Police), Woodland, Rainbow and Pickersgill (all ARP). Pte. E.W. 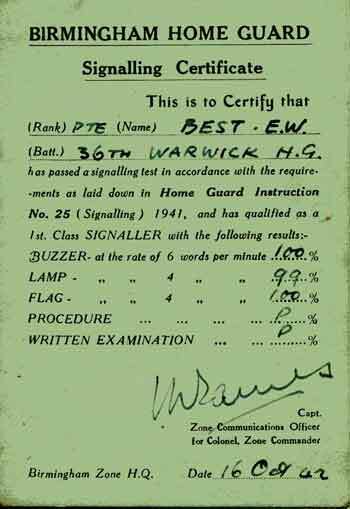 Best of the 36th Warwickshire (Birmingham) Battalion successfully passed his Signalling Test on 16th October 1942. The 36th Warwickshire Battalion, commanded by Lt. Col. A. Scrivener, M.C., (late Royal Warwickshire Regiment) was one of several Home Guard Battalions defending the Edgbaston area of the city. HQ for the Birmingham Zone in which all Birmingham Home Guard Battalions served was in Vicarage Road, Edgbaston. Rex and Charles Owen, brothers both living with their families in Sheldon, were Despatch Riders attached to Zone HQ. Rex and his wife, Flo, also had a remarkable record of hospitality at their home to overseas servicemen. The brothers' DR story is here. The 21st Warwickshire (Birmingham) Battalion was based in Edgbaston but had a wider geographical responsibility, probably for factory Home Guard units in various parts of the city. The headstone (left) in Lodge Hill Cemetery of Vol. 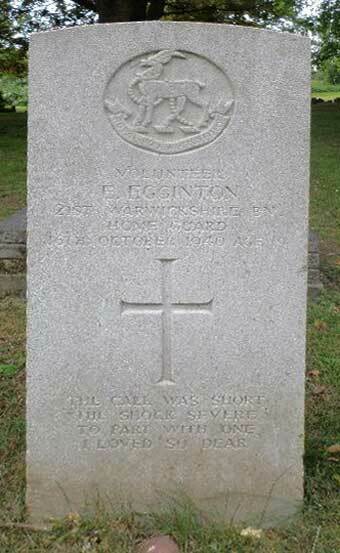 E. Egginton of the 21st Warwickshire who died on 16th October 1940 at the age of 19 years. He was the son of George and Elizabeth Egginton of Selly Oak. 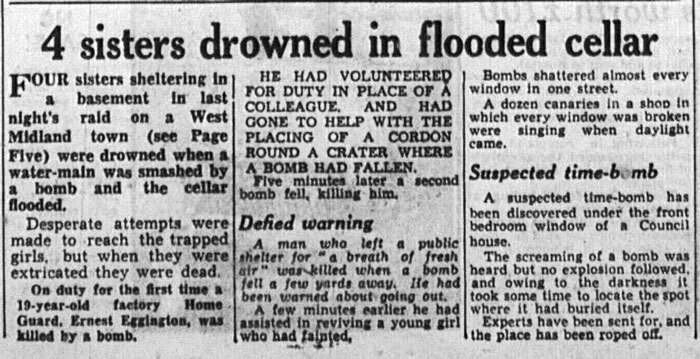 The circumstances surrounding Ernest Egginton's death were described the following day in a local newspaper, together with several other tragedies. It is possible that his place of work was R.T. Shelley Ltd., motor accessory maunufacturers, of Aston Brook Street, Aston. Grateful acknowledgement to Maggie Laity, Barbara Johnson, Colin Baker and Matt Felkin and his "Wartime Birmingham and the Blitz" Facebook page. Grateful acknowledgement to Maggie Laity; and to Matt Felkin and his "Wartime Birmingham and the Blitz" Facebook page. Another member of the 23rd Warwickshire (Birmingham) Battalion was Lt. Leslie Beard of Woodacre Road, Erdington. Two pages of this website are dedicated to his memory. The main page gives details of his life and contains several images of him and his comrades in this Erdington Battalion. The associated page show several images of members of the Battalion receiving artillery training at Umberslade Park at Hockley Heath, involving the Blacker Bombard Spigot Mortar and the 2-pounder gun. A further member of the 23rd Warwickshire was Joseph Bert Virgin. He served between 2nd April 1942 and 31st December 1944. A surviving Certificate of Proficiency from November 1943 confirms his membership of the Battalion's "G" Company and its probable C.O. as Major O. F. Rosbrook. Maj. Rosbrook was originally listed as a lieutenant in the February 1941 Officers List. Also confirmed is the identity of the Battalion C.O. in late November 1943: Lt.-Col. E. W. Walker. Click on this thumbnail to see a further group of officers of the 23rd Warwickshire (Birmingham) Battalion, with one officer, Lt. Percy K. Kimberley, identified. The 52nd Warwickshire (Birmingham) Battalion was also responsible for parts of Erdington. There is a large group image of men from this Battalion, possibly an entire Company, to be seen elsewhere within this website. It is included within a page concerning the Castle Bromwich Spitfire factory as one of the men appearing was employed there. It is not known, however, whether the Battalion had any responsibilities in connection with that huge facility. The story of Lt. George Harry Griffiths who served with the 44th Warwickshire (Birmingham) Battalion in the unit responsible for the defence of the Great King Street factory of Joseph Lucas Ltd.
And the story of another member of the same Joseph Lucas group, Lt. Zechariah Tolley M.M., can be read on an associated page. This includes information relating to his Great War service. Information concerning a third officer in this Battalion is also available. 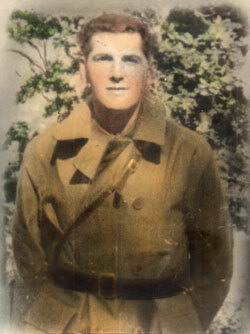 Lt. Jock Orr was a career sodier and joined the 44th in 1941 after leaving the Regular Army. (Full and grateful acknowledgement is made to the above author and website. To read the full article, please click here. Within the same website, here, the author has also published fascinating information about the Hill Top anti-aircraft gun battery . You will leave this website in each case). The 46th Warwickshire (Birmingham) Battalion had a responsibility for areas of Handsworth and also I.C.I. 's huge Kynoch Works at Witton. 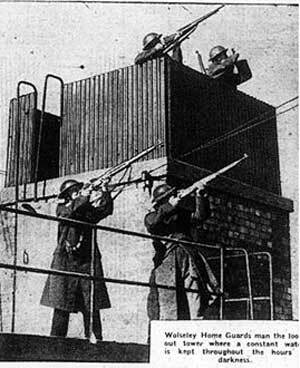 The Stonehouse anti-aircraft rocket battery in Harborne was manned by a Home Guard unit which included Cpl. Eric Holbeche. 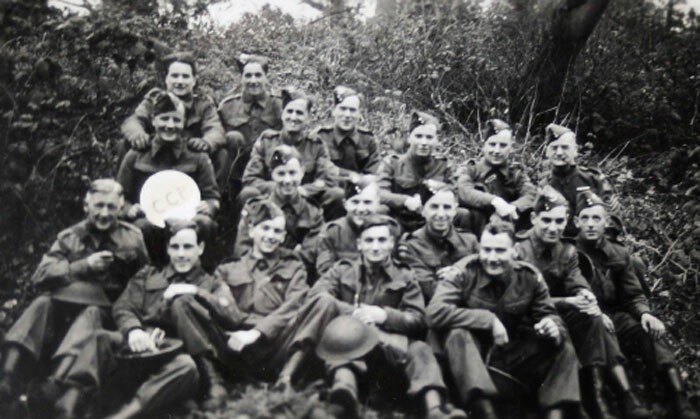 A 1941 image of the Harborne Home Guard Signals Company can be see here. (You will leave this site). Gunner Dennis Nash's story of serving on a Harborne anti-aircraft battery, which includes references to Quinton and Oldbury. (You will leave this site). Pte. Joseph Bennett joined the 22nd Warwickshire (Birmingham) Battalion - which had responsibility for areas of Hockley, Handsworth and Aston - in Decenber 1940 at the age of fourteen-and-a-half and served until stand-down. Click here to read his story. All the officers, warrant officers and N.C.O.s of the 22nd Warwickshire (Birmingham) Battalion were photographed in October 1944 at the Wesleyan Theological College in Friars Road, Handsworth (later Hamstead Hall). Sgt. 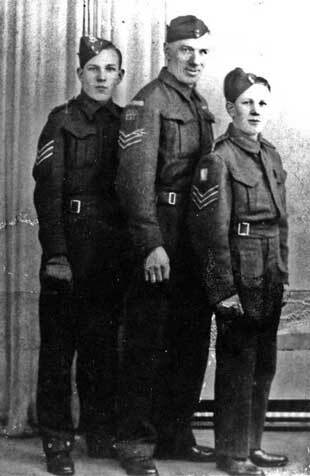 Thomas George Carlin (1898-1949), seen to the right with his two cadet sons, Norman Thomas (left) and Eric William Henry (right), served in the Coldstream Guards during the Great War and was a member of the local Home Guard in WW2. Although employed at Wynn Tunnies(?) & Co. he is thought to have been a member of the Bulpitts & Co. factory unit in Camden Street, Hockley. Also see BIRMINGHAM, ASTON above for mention of two 22nd Battalion heroes of the Blitz. The 51st Warwickshire (Birmingham) Battalion was responsible for this area of Birmingham. Its C.O. was Lt. Col. A. H. Sayer, MC. The story of L/Cpl. Alexander Schadowsky (later Alexander Sinclair), a German national who joined the local Home Guard at a very early age and eventually served in the 71st Warwickshire Home Guard Heavy Anti-Aircraft Battery, “F” Troop. The 27th Warwickshire (Birmingham) Battalion was responsible for this area of Birmingham. Its C.O. was Lt. Col. A. Whittaker. This Battalion may also have had some responsibility for parts of Selly Oak in the earlier part of the War. I've been trying to find out more about the Home Guard in Kings Norton Birmingham. Our Parish Archive (St Nicolas, Kings Norton) has several references to their presence in our Tudor buildings. In our Parish Magazines from the 1940s Cannon Dunn mentions the HG and "Mr Robinson" as having their base in The Old Grammar School. In 1942 they used the Church tower for observation, and in 1943 they were using the 'Saracen's Head' (built 1492!) for 'keep fit' training sessions and causing the old timber building to vibrate. Having consulted your excellent website I've found that Kings Norton did not have its own HG, that Moseley HG, 24th Warwickshire (Birmingham) Battalion, was commanded by Major E H Robinson D.S.C., M.C. I wondered if this was the same "Mr Robinson", and if Kings Norton was part of Moseley Battalion. Helen's contact details can be found on the site's Visitors' Messages page. 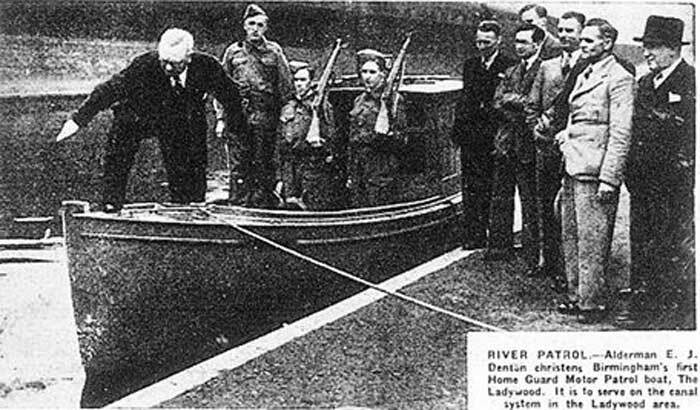 A press cutting from 1940 showing Ladywood's canal patrol boat. Grateful acknowledgement to Matt Felkin and his "Wartime Birmingham and the Blitz" Facebook page. The 43rd Warwickshire (Birmingham) Battalion was responsible for this area of Birmingham under the command of Lt. Col. A. F. Lovell. This page contains images and information about the Austin Works unit at Longbridge, a Company within the 43rd Warwickshire (Birmingham) Battalion. View a magnified, high definition photograph showing the entire Longbridge Company. Information relating to Harold V. Dawson, a member of the Austin Works unit. The 24th Warwickshire (Birmingham ) Battalion was responsible for areas of Moseley and Hall Green. Its C.O. was initially Lt.-Col. E. H. Robinson, D.S.O., M.C. and, later in the war, Lt.-Col. H. H. Little, M.C. This page shows an image of No. 4 Platoon of "E" Company of the 24th Warwickshire (Birmingham) Battalion including one of its members, Sgt. Jimmy Brown. A member of the 24th Warwickshire Battalion unfortunately met a premature death whilst serving within his unit. 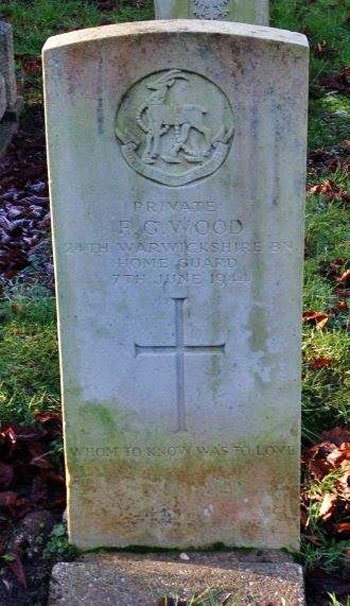 He was Private Frank George Wood, aged 58, a Works Manager of 77 Solihull Lane, Hall Green. He suffered a fatal heart attack whilst, despite his known condition, bravely practising for a "Salute The Soldier" parade in his area. This tragedy occurred on Wednesday 7th June 1944 - D-Day+1, a time of apprehension but great hope. The 25th Warwickshire (Birmingham) Battalion, previously the 5th, was responsible for this area and its factories as well as parts of Aston. Click the heading above to read about this Battalion and about M.B. Wild & Co. and its activities; the air raid on L.H. Newton & Co.; and the involvement of 2/Lt. Harry Poppitt. An image of the Battalion C.O., Lt.-Col. S.W.G. Walker, and a number of its officers can be seen here. (Lt.-Col. F. Jackson took over command later in the War. Home Guard Volunteers A.R. Beesley and A.D. Morrall received Commendations for their work at Nechells Power Station during the blitz of November 1940. Click on this thumbnail to see a group of officers of the Nechells unit. The 50th Warwickshire (Birmingham) Battalion was based in the Perry Barr area. 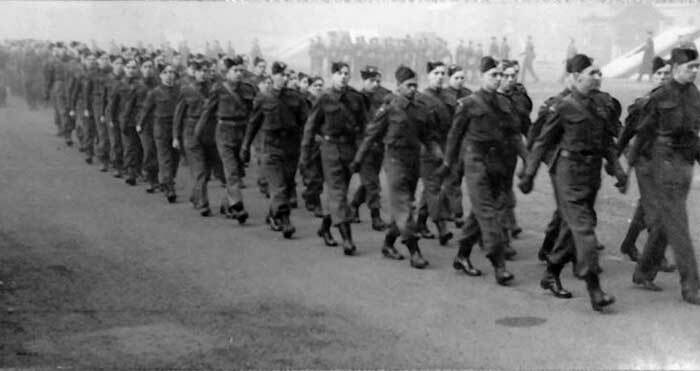 This image shows a small detachment from this Battalion parading in a location outside their area, on the south-western edge of the city centre. They are lined up on the corner of Easy Row and Paradise Street. The date and occasion of this event are unrecorded. But one possibility, based on the winter conditions and the location, is that they are involved in the final stand-down parade which marches through the centre of the city on Sunday December 4th 1944. Alf Bradbury served in the Home Guard in Perry Barr and was probably a member of the 50th Warwickshire (Birmingham) Battalion. During firewatching duties Alf produced a series of wonderful sketches depicting Allied and German armoured vehicles and intended for Battalion training purposes. His story and the sketches can be seen on this page. Vol. Thomas Belcher, a member of the 40th Warwickshire (Birmingham) Battalion, died on 6th November 1940. A newspaper records the inquest. Acknowledgement to Matt Felkin and his "Wartime Birmingham and the Blitz" Facebook page. There is information on Quinton in the Worcestershire section of the website. Lt. E. J. Moon M.C. was an officer in the 42nd Warwickshire (Birmingham) Battalion of the Home Guard which was responsible for the defence of an area covering Robin Hood, Sparkhill and Acocks Green. His page on this website includes a fully captioned image of the Battalion's officers and details of a celebratory dinner in 1944 at the Imperial Hotel, Birmingham. The 49th Warwickshire (Birmingham) Battalion, under the command of Lt.-Col. H. J. Gittoes, covered the Selly Oak area (although the 27th Warwickshire had some responsibility for it, at least in the first years of the war). After stand-down a Comrades Association was formed which later evolved into the 49th Rifle and Pistol Club which still exists. There is a web page about the Battalion and its later history here. (You will leave this site). Rex and Charles Owen, brothers both living with their families in Sheldon, were Despatch Riders attached to Zone HQ in Edgbaston. Rex and his wife, Flo, also had a remarkable record of hospitality at their home to overseas servicemen. The brothers' DR story is here. This area of the city was defended by the 37th Warwickshire (Birmingham) Battalion, Home Guard, commanded by Lt.Col. A.L. Paterson, M.C. and later by Lt.-Col. H. J. Taplin. One of this Battalion's members was Charles Herbert Skellett. Charles Skellett served in the Great War and in 1940 volunteered for the Home Guard, being appointed sergeant in March 1941. He regrettably did not live to see the peace as he passed away in February 1945, just two months after the Home Guard's stand-down. 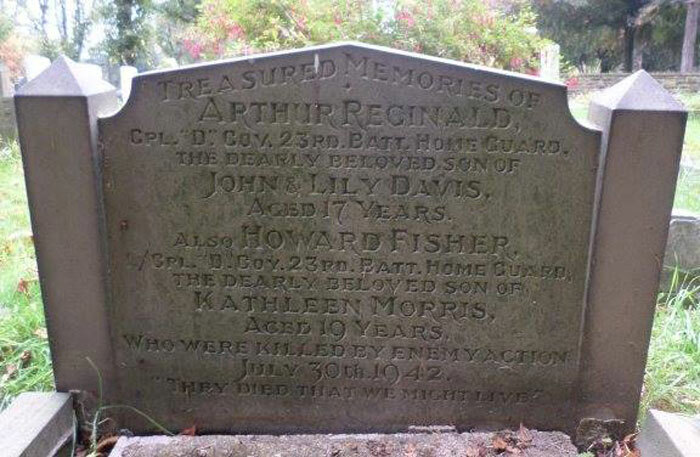 His daughter has contacted this website and is appealing for any information about this unit and her father's role in it, and especially for any unit photograph which may have survived. If you can help, please contact this website via Feedback and we shall ensure that all information is passed on. Several Home Guards, members of the 6th Birmingham Battalion, were honoured for their heroic work during the night of 19th/20th November 1940, when the BSA factory was bombed and many employees lost their lives. They were Albert William Bailey who received the George Medal (pictured right) and J.H. Beattie, William Saragine and Joseph Topham, the British Empire Medal. 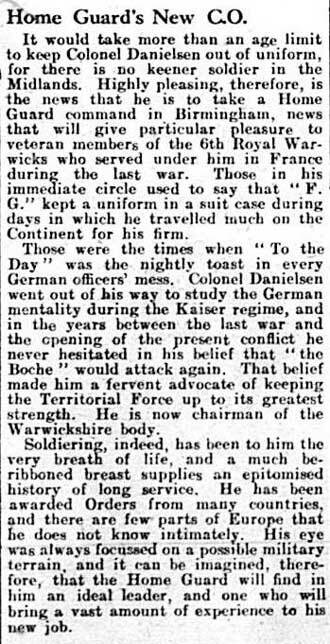 These are extracts from a contemporary newspaper report following the announcement of various George Medal awards. "Volunteer Bailey, Home Guard, who receives the George Medal, was due to report for duty at 9.30 p.m. on the night of a heavy air raid on Birmingham. Hearing bombs, he arrived at about 7 p.m. and remained on duty, helping to deal with incendiary bombs. He went to headquarters about 9 p.m. There he met an officer of the Guard, who call for volunteers to rescue those trapped under the debris of a building which had suffered direct hits by bombs. 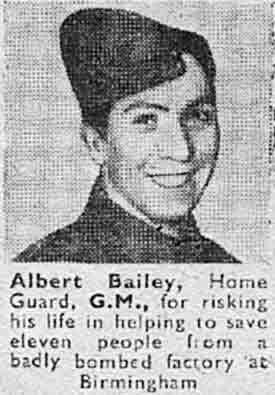 Volunteer Bailey first helped to rescue a Home Guard, and later, with another Home Guard, got out two workmen from the same place. He then went to the other side of the debris, helped out a man and then a girl, and tried to get through a hole but came to concrete. He then attempted to knock a hole through the concrete without success, a girder stopping progress. An oxyacetylene cutter was used to cut through this, and a girl and four men were got out. A fierce fire was burning inside, but Volunteer Bailey held up a piece of concrete with his arms for some time and became saturated with oil and water. He eventually collapsed near the entrance to the hole and was taken home in an ambulance." "One of the three Home Cards awarded the medal of the Military Division of the O.B.E. is Volunteer Saragine, a dispatch rider. He was continuously on the road visiting damaged places and various firefighting stations during an enemy air raid on Birmingham. On at least one occasion he passed within a few feet of a delayed action bomb, so that he might waste no time his journey." 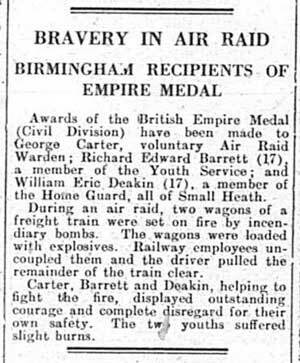 In a separate incident another Small Heath Home Guard, William Eric Deakin, showed exceptional bravery and was later honoured, together with Richard Edward Barrett of the Youth Service and George Carter, an ARP Warden. Read the story of a member of the 37th Warwickshire (Birmingham) Battalion. Harold Lucas who worked on Lancaster tooling at William E. Farrer in Heath Mill Lane, Digbeth was later a member of the 107th Warwickshire Battalion which manned an anti-aircraft "Z" rocket battery on Billesley Common. 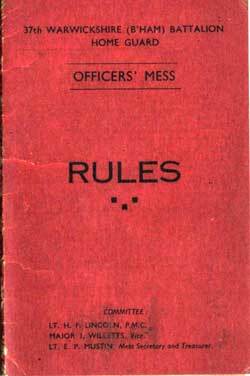 The booklet containing the rules for the Battalion's Officers' Mess, mentioning the name of Lt. H. F. Lincoln, P.M.C., Major J. Willetts and Lt. E. F. Mustin, Mess Secretary and Treasurer. Grateful acknowledgement to Jacqui Fielding; and to Matt Felkin and his "Wartime Birmingham and the Blitz" Facebook page. The following image shows a group, almost certainly a platoon, which was a unit in the 37th Warwickshire (Birmingham) Battalion and/or a works unit associated with a factory in the same area. (In Birmingham, works units were either part of the battalion responsible for the geographical area in which a factory was located; or part of a battalion which had a specialised responsibility for similar units over a wider area. Successors of the original 6th Birmingham Battalion fell into the latter category: the 42nd Warwickshire in the Small Heath area was one of them). George Owen Millward is located fifth from the right, middle row, in the above image. He lived in Golden Hillock Road. He was a millwright and worked at B.S.A., Small Heath; this was a reserved occupation which prevented him from joining the regular forces. George was unwell and off work when the factory suffered its devastating attack during the night of 19/20th November 1940 and he was fortunate in surviving whilst many of his fellow employees lost their lives. Several members of George's family also worked at the factory at the same time and they were all fortunate in surviving. The photograph was taken at the Royal Warwickshire Regiment Barracks on Golden Hillock Road (which has survived into the 21st century and is now home to the Royal Signals Territorials). The building on the very edge of the picture appears to be the one on the corner of Ansell Road. George's King George VIth Commendation certificate confirms that he served in the Home Guard between December 1940 and October 1943; after a break in service he rejoined in August 1944 and served until stand-down in the following December. Grateful acknowledgement to Jackie Cotterill, daughter of George Millward; and to Matt Felkin and his "Wartime Birmingham and the Blitz" Facebook page. Capt. H. W. "Bert" Webb commanded the HQ Company of the 37th Warwickshire (Birmingham) Battalion. Two pages within this website are dedicated to him and contain several high-quality group images of him and his comrades with a number of the men identified. Stephen Williams, of 120 Little Green Lane, Small Heath, was also a member of of the 37th Warwickshire (Birmingham) Battalion. He can be seen on this page of the website with a group of other senior NCOs, photographed at the Royal Warwickshire Regiment Barracks on Golden Hillock Road, the location of several other images in this website showing members of the 37th Battalion. The life of Lt. Leslie McGregor of the 37th Warwickshire (Birmingham) Battalion is remembered in this website. Vol. Dennis Herbert Phillips (b.1918) of the 47th Warwickshire (Post Office) Battalion lived in Sparkhill. He lost his life when on duty on 23rd November 1940 at the age of 22. He was one of the victims of a direct hit on the 47th Battalion guard room during the severe overnight raids of 22nd/23rd November on various parts of Birmingham. Another Home Guard was killed in the same incident. Dennis Phillips now rests with his parents in Solihull Cemetery. A separate page of this website contains the formal reports written by various Home Guards who were involved in this tragedy. Sgt. Horace Frederick Rockett, together with his wife Kate and their 16-year-old daughter Beryl, died during the night of 11/12th December 1940 when their home at 85 Leominster Road, Sparkhill received a direct hit. Horace had served in the Coldstream Guards during the Great War and had been wounded twice. He volunteered for the Home Guard at its formation and served as a Sergeant in the 4th Birmingham Battalion, one of the ten initial battalions in the Birmingham area. (Grateful acknowledgement to Andrew Thornton; and to Matt Felkin and his "Wartime Birmingham and the Blitz" Facebook page). The 39th Warwickshire (Birmingham) Battalion was responsible for this area of Birmingham. Its C.O. was Lt. Col. A. G. Colley. Here are images and information concerning the Stechford Home Guard, the 39th Warwickshire (Birmingham) Battalion which included a Rover factory unit, and one of its long-serving members, Eric Pain. Also memtioned is the Grand Concert (see below). This page contains images of the Official Programme for the fund-raising Grand Concert organised by the Battalion at the Alexandra Theatre in Birmingham in December 1941; and also of all the units within the Battalion including many of their members. The Copsey brothers of Charles Edward Road, South Yardley had close dealings with local units, the elder, Dennis, with the 38th of which he was a member before being called up as a Bevin Boy; and Len with the 39th which provided help with his military training as a young cadet. Their story is here. And reminiscences and images from another member of the 39th Warwickshire (Birmingham) Battalion, Pte. Geoffrey Bennett including the night when he and his section overran Elmdon Airport! Pte. William Henry Bryan/span> was probably a member of the 39th Battalion also. His activities at Marston Green are described here. Read about the night when John Welch of Hidson Road received a knock on the door from the local Home Guard. Home Guard Volunteer Reuben Haigh, a gas clerk at the Washwood Heath gasholder, was awarded the George Medal for his bravery there during the blitz of November 1940. Vol. S.A. Tyler received an official Commendation for his work during the same incident. "At about eight p.m. on 22nd November 1940 a number of incendiary bombs fell on the Wagon Repair Shops and on Washwood Heath Gas Works. Haigh was P 19 Company Duty Officer and after one or two small fires in P 19 area had received attention, he proceeded, with Volunteer A. S. Tyler, to the Gas Works. They found two fires in the coal stack and extinguished them. Two smokescreen containers had been ignited and were burning with considerable flame. These, in the absence of equipment for dealing with oil fires, were extinguished with some difficulty. There was a plume of flame in the crown of one gas holder; at the time the crown on the gas holder was some 200 feet high. Haigh, taking the initiative and with three other men, ascended to the crown of the holder carrying sacks, and after considerable effort extinguished the fire and partially stopped the escape of gas with bags and clay. Another aperture in the crown of the holder, through which gas was escaping but not burning, was dealt with in the same way. No protective equipment was carried. The raid was still in progress, with bombs dropping in the vicinity, and the flame from the holder must have provided a continuous beacon. The action taken by Haigh and the other three men not only promptly removed the beacon but also saved a considerable quantity of gas from escaping." Please see also the History of the 29th Warwickshire (Birmingham) Battalion. - Information and images relating to the 35th Warwickshire (Birmingham) Battalion which consisted of members of the Birmingham Auxiliary Fire Service (A.F.S.) ; and of A.F.S. Depot 6/1 which was located in Washwood Heath. The 46th Warwickshire (Birmingham) Battalion was responsible for this area of Birmingham. Its C.O. was Lt. Col. C. W. P. Blackmore, MC. ".........My story begins in 1939 when I answered a call to join the "Local Defence Volunteers" (LDV). Issued with an armband and a truncheon, I patrolled the outskirts of the GEC at Witton, confident with the information that any German paratrooper, unstable as he landed would be easy meat. This I did for two hours per night, three times a week. Quite rough on a 17 year old working a 48 hour week! Then the "Home Guard". Armed with a Canadian Ross rifle and five rounds, I was stationed on the flat roof of the Clifton cinema at Great Barr. With the bombs whistling overhead and shrapnel falling like rain, our job, again three nights a week, was to sight major city explosions and fires and declare the sighting angle. Together with similar sightings carried out at other high points the convergence gave a near indication of the bombed area. So, I was pleased in 1941 to be released by my employers to join the RAF.......... "
My father, Stanley Laight, was in the 46th Battalion. He worked at Higgs Motors as a universal grinder and cutter. I was born in 1939 and so my recollection of dates is rather unclear. I do recall an event which started at something like a range on the edge of Witton Cemetery - there was some shooting and some bangs and other demonstrations of military activity. Afterwards we all walked to the HQ at Witton where there was some form of entertainment including tea and sandwiches. I am unsure of the date but I assume it was 1944 or 45. I assume this activity was only of platoon size as there were only about 20 soldiers taking part. I recall my father in uniform and that he did night firewatching which he said was at Higgs Motors, Witton. I also have a recollection that he sometimes brought his rifle home. I presume my father is somewhere on the large photo but could not identify him. This Company, like all major factories in the area, had its own works Home Guard unit. It was part of the 46th Warwickshire (Birmingham) Battalion. Just one of its members has been so far been identified with reasonable certainty. Samuel Rhodes (1903-1953) lived in Westwood Road. He had been born in Birmingham but spent his early life from the age of nine in Canada, returning in the mid-1930s. The war years found him working at the G.E.C. Just two relics from those times survive: his G.E.C. 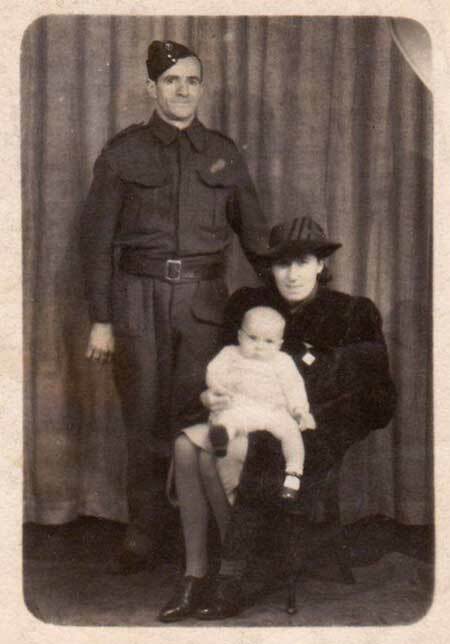 Home Guard lapel badge and an image of him in uniform taken in autumn 1944 with his wife and newly born son. One unfortunate officer of the Yardley Home Guard, and his wife, became a victim of the Blitz a long way from home. He was Mr. F.W.T. Charles of 191, Queen's Road, Yardley, a testing officer with the G.P.O. and a member of the Birmingham G.P.O. Home Guard, the 47th Warwickshire (Post Office) Battalion. He and his wife were killed in Willesden, London. (Click on title to view). Bidford was defended by a Platoon of the 4th Warwickshire (Stratford) Battalion. One of its members was Pte. Kenneth David Boyles. Read his story here. A happy group of 12th Warwickshire (Coventry) Battalion men having a breather during a training exercise. To see images of and interesting information about the Humber Works Home Guard - part of the 15th Warwickshire (Coventry) Battalion - and about an adjacent battalion, the 16th Warwickshire (Coventry), click here. That linked site also contains details of the several Coventry Home Guard men who lost their lives. (You will leave this site). Philip Aidan Brain (right) worked in a reserved occupation and was a member of the Humber factory HG unit. He served as a Despatch Rider and was also heavily involved in recovery activities after the blitz on the city. He recalled the moonlight on the night of the November 1940 raid as being "as bright as day". In the winter of 1942, the 16th Warwickshire (Coventry) Battalion received a Defence and Training Instruction, typical of the flood of paperwork pouring down on Home Guard battalions at that time. You can read it here. 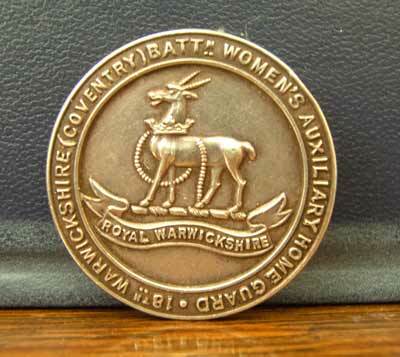 The Women's section of the 18th Warwickshire (Coventry) Battalion had their own insignia in the form of a handsome medallion inscribed "18th Warwickshire (Coventry) Battn. Women's Auxiliary Home Guard". This is shown to the right. Further information about this type of medal has subsequently come to light (Dec. 2017). It is thought that it was a commemorative medal issued to Women Auxiliaries in Coventry at the time of stand-down in Decmber 1944. A variant, coloured silver but otherwise identical, is known also to exist. Colonel C. W. Clark D.S.O., M.C. (late of the Tank Corps) was its first Commanding Officer, superseded in due course by Lt.-Col. E. C. Dickinson. Reports survive of various social and fundraising activities by the Battalion. On one occasion a dance was held at the Drill Hall with the proceeds being in aid of the Red Cross and St. John Prisoners-of-War Fund. The Royal Warwickshire Regiment Dance Band provided the music. The M.C. was Captain C. H. Jinman. On another occasion "A" Coy. put on a revue entitled "This is the Home Guard" which resulted in a sum of £65 pounds being raised and contributed to the "Coventry Evening Telegraph" Parcels Fund. A cheque was handed over by Captain J. H. King of "A" Coy. The interesting reminiscences of Mr. George Pearson in his local unit whose HQ was the Bull & Anchor in Wheelwright Lane. (You will leave this site). Here is the exciting story of how Pte. Frank W.C. Smith and his Home Guard comrades defended his factory, A.C. Wickman Ltd., from the Drawing Office roof during a daytime attack by a lone Junkers 88 on Friday, January 10th 1941. (You will leave this site). Interesting details of life on a Coventry AA Rocket battery in Memorial Park are provided by Mr. H.J. Poulter. (You will leave this site). The Home Guard unit of George Wilson Gas Meters investigates a suspected spy in the factory in Put One Up The Spout Fred. (You will leave this site). "........Because our house was destroyed by a bomb we moved to Coventry. I was now 20, and although I had signed up with my age group to join the forces I was sent to Morris Motors. Once again my life changed and I was working in a factory making munitions and new friends who were also strangers to factory life.The memory of Coventry was joining the 18th Battalion Warwickshire Womens Home Guard, one of the few forces in England. Apart from the bombs life was good with many new friends. We formed a concert party comprised of talented people from the munitions factory who came from all over the country. Our audiences were the RAF and Army boys stationed around Warwickshire.I have very fond memories of the last show of the Home Guard, This is the Home Guard, which was held in the Coventry Hippodrome on the 3rd of December 1944. Our audience of over 500 packed the theatre and came from camps all over Warwickshire. That I think is the memory I have of war days. The joy and the pleasure of hearing them sing our songs and their songs; the applause we had was wonderful. At the end of this last show a senior officer thanked us and presented us with a silver medal for all our work. It reads: 18TH WARWICKSHIRE (COVENTRY) BATTN WOMENS AUXILIARY HOME GUARD.The war ended in September 1945. We celebrated in London and had the honour of walking in the victory parade. My experiences in the Home Guard were very different from the war days I knew and went through in my home town. War changes lives but memories live forever. I made many good friends and my family was very fortunate as we all survived.........."
Within a fascinating and moving memoir of a city under attack, A Child's War: In Coventry, Mr. Peter Cox describes a city centre exercise where the local Home Guard takes on a unit of battle-hardened Polish troops. (You will leave this site). Sgt. Bill Hammond was a member of the Dorridge Home Guard. This page of the website tells us a little more about his life and Home Guard service and includes an image of him and a number of his comrades. In My War in the Local Defence Volunteers, Mr. Ken Clark gives an interesting description of his service in the Hilmorton unit and later with the Singer Motors factory unit in Coventry. (You will leave this site). A glimpse of an earlier WARWICKSHIRE Home Guard. Click here to see an image of the Knowle and Dorridge Volunteers in September 1918. Leamington, Warwick and adjoining areas were defended by the 1st Warwickshire (Warwick) Battalion. There are several pages of images of this Battalion elsewhere within this website. Sidney Flavel & Co. Ltd. was, and under a different name continues to be, a large factory producing gas appliances. It was big and important enough to justify its own Home Guard platoon as well as other factory defence personnel. The Home Guard unit was part of the 1st Warwickshire (Warwick) Battalion commanded by Lt.-Col. J.H. Alexander, DSO, MC. In that period there was published a regular factory defence newsletter/magazine entitled "Eagle News". Three surviving copies of this, from 1942 and 1944 and mentioning various personnel, have been reproduced. Click here to view. "We You Salute - Your Local Dad's Army" by the late Mr. Roy Rowberry (one time private in No. 8 Platoon, "B" Coy., 1st Warwickshire Battn.) is a book published in 1990. It contains much information about the various Home Guard units in Leamington, including the Flavel and Lockheed factory platoons; and contains many illustrations supplied by various private contributors. One assumes that it is long since out of print but second-hand copies can still be obtained. It is well worth the effort of seeking one out. Pte. William Henry Bryan served in the Marston Green unit of which an excellent image taken at Chapel House Farm may be seen here. It has yet to be confirmed whether this unit was part of the 39th Warwickshire (Birmingham) Battalion or the 5th Warwickshire (Solihull) Battalion. Further information about both Battalions is available elsewhere in this website. Vol. Cyril Jones, a member of the local Home Guard, died in Solihull Hospital on 20th December 1940 as a result of injuries sustained during the evening of 22nd November. On the night of 22nd/23rd November heavy attacks were made on various areas of Birmingham including Elmdon. Cyril was not on duty at the time but was in the hallway of his home which he shared with his widowed mother at 91 Ulverley Green Road. His injuries were caused by shrapnel from a bomb which exploded just outside the house. He was 19 years of age. Lt. Gerald George Cates of 5 Winterbourne Road, Solihull and a member of the 5th Warwickshire (Solihull) Battalion	lost his life in April 1942 in a "friendly-fire" accident at a Combined Services demonstration at Imber Down on Salisbury Plain. His comrade, Capt. D. Hirons also attended but escaped injury. 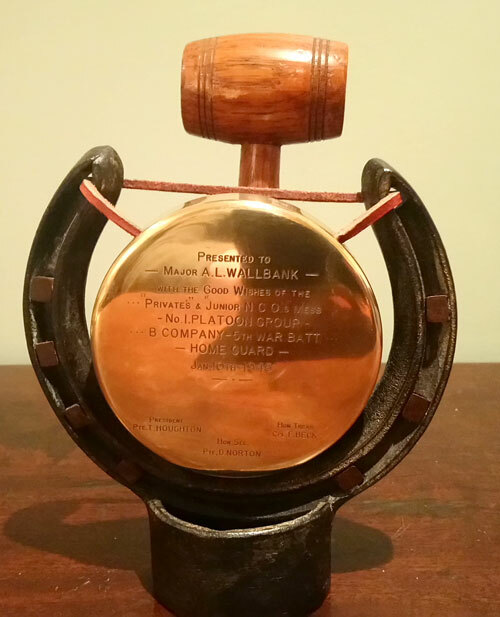 An interesting memento was presented to Major A. L. Wallbank, probably Company Commander of "B" Coy., 5th Warwickshire (Solihull) Battalion by members of the Privates and Junior N.C.O.s Mess, No.1 Platoon Group, "B" Company, 5th Warks. The presentation took place on Wednesday 10th January 1945 and those mentioned on the gong are Pte. T. Houghton (President), Cpl. F. Beck (Hon. Treasurer) and Pte. D. Norton (Hon. Secretary). "C" Coy., of the 2nd Warwickshire (Rugby) Battalion was responsible for the defence of Southam and the adjacent area. The linked page contains images and the names of some of this units members. Four members of the 4th Warwickshire (Stratford) Battalion look on whilst the youngest does all the digging! Click here to read about several members of the Sutton unit, the 6th Warwickshire (Sutton) Battalion, including mention of A.H. Ball, H. Bigwood, Charles Clarke, Norman Darby, John Evans, Jack Kemp, Ed Mynett, M.E. Padley, Harold Pearce, Horace Proffitt, Josiah Reed, John Smith, Rupert Thomas and Eric Westrup. Sutton Coldfield Rifle And Pistol Club celebrates seventy-five years of existence this year. The club was formed by members of the Home Guard in Sutton Coldfield. Copies of any documents or photos relating to the original formation of the club would be gratefully received for our archives. Many thanks. If anyone can help with the provision of such information, both Mr. Charles Shepherd of the Club and staffshomeguard will be extrememly grateful. Please use the website FEEDBACK facility if you can help. Captain John Reardon Brosch was another member of the 6th Warwickshire. Click to read his story and see group images of units within the Battalion. Sgt. William Thornton and Cpl. Douglas Thomas also served in Sutton in the 6th Warwickshire. Read their illustrated story as remembered by William Thornton's son; within it are other memories of the town in wartime and also mention of Cpl. Peter Bate (see below). This 1941 diary written by Cpl. Peter Geoffrey Bate of Mayfield Road provides fascinating glimpses of the Sutton Coldfield Home Guard and of other aspects of life in the town at war. Wilfred George Vernon Knott, who lived in Penn's Lane and was in a reserved occupation as a tool maker, is likely to have been a member of the 6th Warwickshire before being transferred to anti-aircraft duties for which he served as a sergeant in the 105 Warwickshire Home Guard Rocket A.A. Battery. An excellent, detailed image of Sgt. Knott and his anti-aircraft battery comrades is available on another page of this website. Cpl. 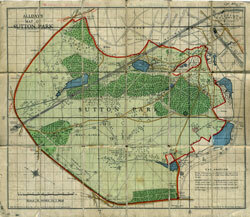 Rudge, an unknown member of the 6th Warwickshire (Sutton) Battalion, owned a map of Sutton Park on which, in 1943, he noted points of interest associated with his Home Guard activities in the park. The Whitacre (No. 7) Platoon of "C" Coy. 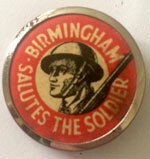 within the 29th Warwickshire (Birmingham) Battalion was transferred to the 6th Warwickshire on 1st March 1942. 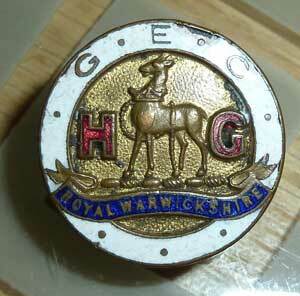 The 29th Warwickshire was responsible for all the Birmingham city utilities and within it "C" Coy. for water supply facilities. Members were all employees. It was felt that employee numbers at Whitacre were insufficient to provide sufficient cover and the latter could only occur with a larger pool of local men available to be drawn upon. 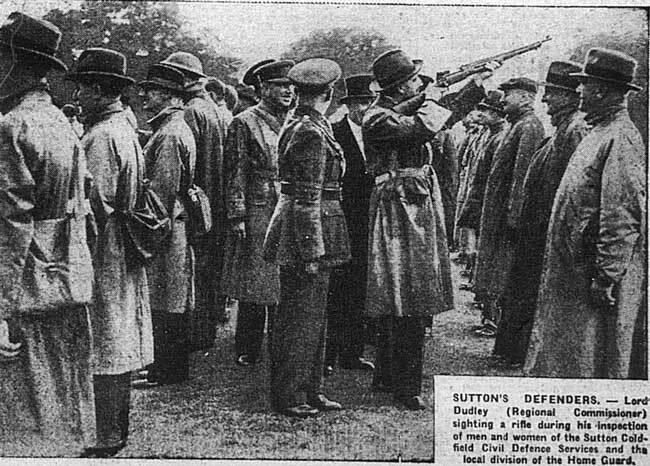 A very early image of the Sutton Home Guard being inspected by the Regional Commissioner, Lord Dudley. Acnowledgement to Matt Felkin and his "Wartime Birmingham and the Blitz" Facebook page. This is thought to be an image of a Sutton group, perhaps a Section or small Platoon, but has yet to be confirmed as such. Acnowledgement to Graham Knight and to Matt Felkin and his "Wartime Birmingham and the Blitz" Facebook page. The Sutton Coldfield Volunteers, a defence force from an earlier era, were photographed in the town at some time during the Great War. Click on the title to see the image. In April 2005 there appeared and was sold on eBay an autograph album which appeared from the illustration to have been beautifully produced. It had been signed and presented to Lt. James Iveson by members of his No. 7 Platoon, "B" Coy., 6th Warwickshire (Sutton) Home Guard - a unit adjoining the 32nd (Aldridge) Battalion - in appreciation of his leadership on the occasion of his being transferred to become Commanding Officer of No. 6 Platoon in September 1941. The late Mr. David Riggall, a chemistry master at Bishop Vesey's Grammar School prior to his transfer to essential war work on explosives, provided within his memoirs a glimpse of Civil Defence support duties in Sutton in 1940. This was originally published within the BBC People's War Archive under the title "What Did You Do in the War, Daddy?" 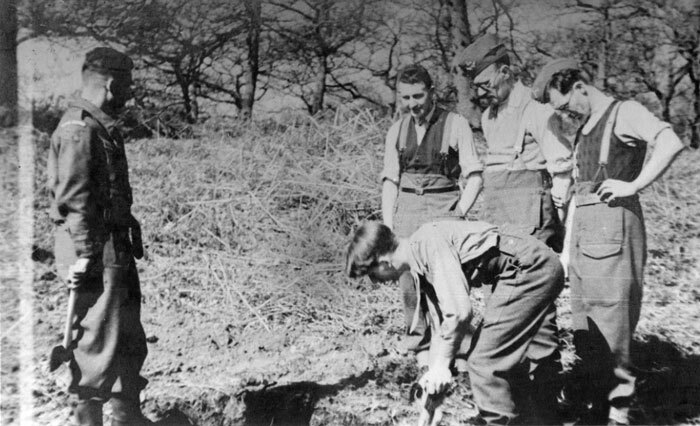 "....In January 1940, I moved digs to no 3 Royal Road, Sutton Coldfield, recommended by Mr and Mrs de Jersey (distant relations) who thought I might be put up under better conditions than at 90 Victoria Road.......Fortunately ‘Beery Barratt’, a Master at Bishop Vesey’s was leaving his digs to get married and strongly recommended them, since the owner was Manager of a butcher’s shop in Sutton. In war-time, that was an important consideration. "....On Sunday May 7th 1940, I had my first night at the Report Centre, from 6-11pm, and then two days later I was there from 11pm until 8.30am. Mr Hudspith, the French Master at Bishop Veseys, who often invited me to his house in Belwell Lane, had persuaded me to join this Civil Defence job at Sutton Council House. We had to man the telephones out of office hours, taking messages from organisations such as the Auxiliary Fire Service, the Home Guard (called the Local Defence Volunteers or LDV at first), and the Rescue Services. We then passed them on as required. It was anticipated that enemy parachutists might be dropped to disrupt services and their location needed to be reported by the public and pin-pointed as soon as possible. If the telephones had broken down we would have had to go out and deliver the messages in person. In fact, we never had anything serious to deal with, only a few suspicious circumstances reports and normal peace-time mishaps. We actually had a marvellous time, telling jokes and playing solo for halfpennies. If nothing seemed to be happening by about 1 or 2am we unrolled the mattresses provided and went to sleep in the Council Chamber or elsewhere. We went in usually about 3 times a week, on various shifts. One preliminary requirement for this service was to attend a Gas Course held at Oakhurst in Anchorage Road. This was a series of lectures about the types of gas likely to be used, procedure etc and finished with a practical exercise of putting on a mask and going into a room full of gas (probably tear gas). At the end of November 1940, I changed my digs again, this time to Leafield at 31 Clifton Road in Sutton........."
The title of David Riggall's memoir could equally have been adopted by the French master at Bishop Vesey's Grammar School who is briefly mentioned above, Mr. William Hudspith, had he ever written of his experiences. There was rather more to William Hudspith's wartime activities than could ever have been imagined by his colleagues and pupils. 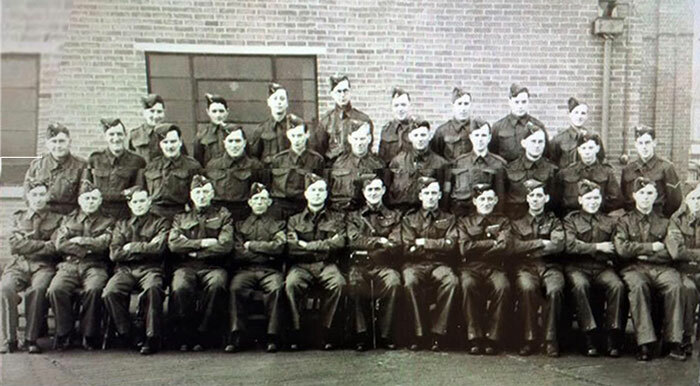 Click to read the remarkable story of this Sutton Coldfield Home Guard. It appears that the war had some effect on the academic performance of boys at Bishop Vesey's, or was at least a quotable excuse. In 1941, according to 'A History of Bishop Vesey's Grammar School - The Twentieth Century' by Kerry Osbourne, "thirteen out of twenty-nine boys from form 5M1 failed their School Certificate but the Headmaster explained that they 'were giving a good deal of time to Home Guard duties.'" "The Home Guard Company and Platoon HQ was at Southam. In Ufton our Section had a sergeant and 9 privates. We were all countrymen, not very good at drill, but all very good shots! Our routine was a parade one evening a week in Ufton Village Hall. Three of us carried out guard duty at Southam HQ overnight once a month. We were guarding the ammunition store, which was one room in a Public House. The rifles were P47 American 'lease lend'. Occasionally we had weekend manoevres, but by Sunday morning most of the privates had disappeared to milk the cows." 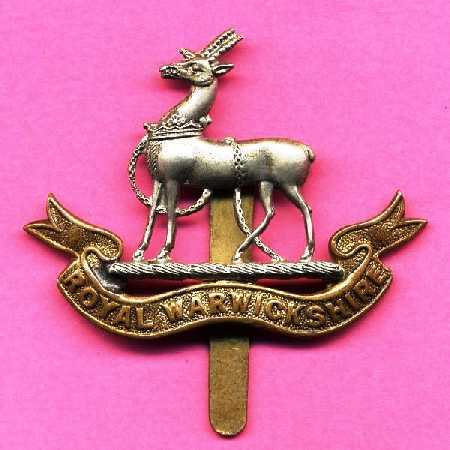 Warwick, Leamington and adjoining areas were defended by the 1st Warwickshire (Warwick) Battalion. There are several pages of images and information relating to this Battalion and these are listed on the 1st Warks (Warwick) Battn. SUMMARY PAGE which provides links to all of them. They include pages in memory of Lt. Cecil Fullerton (Pat Fullerton) and Cpl. Ernest Frederick Cushing. Memories of Warwick Home Guard by Mr. Bernard Grimes and Mr. Tom Leedle in Blackout Duties in Warwick. (You will leave this site). 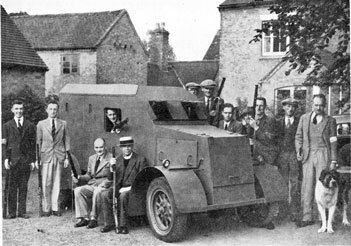 The Marton Platoon had the distinction of possessing, as a result of its own initiative, the first armoured vehicle within the entire Home Guard. Its arrival even anticipated the issue of uniforms for the men who were to operate it. It was apparently built by Councillor Sam Myers and known as "The Trojan". It thought to have been dismantled when the Home Guard was disbanded. An image of the vehicle is shown right. The vicar of Marton, the Rev. A. Wilbraham was a member of this Platoon. He had been an officer in the Great War. He was initially a member of the ARP but soon joined the Home Guard with the rank of Sergeant with a particular responsibility for training in drill, musketry, map-reading and anti-gas measures in the Marton Platoon, No. 3 Platoon, "A" Company, 2nd Warwickshire (Rugby) Battalion. He later became Company Training Officer with the rank of Lieutenant. He is shown within this image, with dog-collar and rifle. Even in these early days No. 4 Platoon possessed its very own armoured car. It is, indeed, the platoon's sole claim to distinction that it possessed the first British L.D.V. armoured car. Immediately upon the formation of the L.D.V. the platoon's second-in-command contacted friends in Coventry in search of a chassis suitable for conversion into some form of fighting vehicle, and the scrap yards were combed (in vain) for iron sheeting. A number of chassis were offered, but by far the most suitable was a Morris Commercial lorry presented by the Parkside Garage Coy., and this was taken over by Mr. Sam Myers, a well-known member of Coventry City Council, The lorry was towed to Mr. Myers's works at Warwick, and, at his very considerable expense, there fitted with a complete armoured body, solidly welded, its front and sides punctuated with suitable armoured embrazures for small arms and machine gun fire. The ¼-inch armoured plate was thoroughly tested at Wedgnock, and was proof against .303 at 100 yards. The vehicle was delivered and in commission within three weeks of the formation of the L.D.V., (i.e. in June 1940) and thereafter did Trojan work as an aid to training, while also providing an invaluable means of transportation without which this scattered unit would have been faced with many a quandary. Its early arrival is "dated" in the accompanying illustration by the fact that it preceded denim, and then carried as its sole automatic weapon a captured German tommy gun of the 1914-18 era, remarkably similar in operation to the eventual Sten carbine, and using the same ammunition. The German relic was replaced soon after by the first Lewis M.G. issued to Battalion, and this was mounted to fire forwards through an armoured embrazure. Vivid were the dreams of its well-practiced crew of the day when "the old tank" might rumble into the midst of descending parachutists, its sides belching fire (at the rate of 10 rounds per man - dreams too often broken by the wail of Coventry's sirens, when the old car was often "stood to" lest the dream should be fulfilled after. Acknowledgement also to David Morse and to the Coventry Telegraph. "Prior to the start of the war, the government was eager to have the population ready in case of air raids, should war be declared. My father put himself forward as an ARP Warden, our house becoming a temporary wardens post, mainly as a distribution centre for gas masks to the locals. 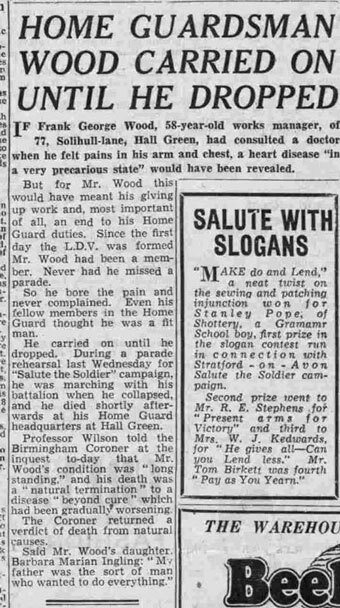 Later, as volunteers were called for the LDV (Local Defence Volunteers) my Dad left the ARP and, eventually, became a sergeant in the LDV, later known as the Home Guard. It fell to my lot to keep his uniform and equipment in good order for his regular parades and exercises. This meant polishing leather gaiters and belt, cleaning rifle, bayonet and any brasses. He would put on his equipment and cycle off to his duty, the rifle slung under the cross bar of his bike. On one occasion, he was pulled up on parade for having his bayonet the wrong way round in its scabbard, this leading to me having a telling off as being responsible. Not that I got any pay for my war cleaning contribution. Dad also had to put in an appearance at his works on occasions to do fire watching, his company having timber stores that were liable to take a liking to incendiary bombs." 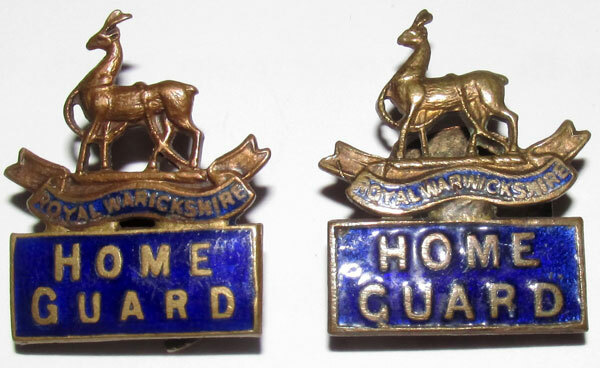 Two commemorative badges for the Warwickshire Home Guard - the right-hand one with the more successful depiction of the county name! Contributions from visitors are warmly welcomed - and, please, an alert on any non-functioning link. Use FEEDBACK if you have material you would like to appear here. Grateful acknowledgement for badge images to Stanley C. Jenkins and A.N. Other. - for Safari (iPad/iPhone), type name in address bar; from drop-down list use "On This Page"
- for Android devices, three menu dots (top r.h. corner), then "Find on page"